The Magellanic penguin is a South American penguin, breeding in coastal Argentina, Chile and the Falkland Islands, with some migrating to Brazil. 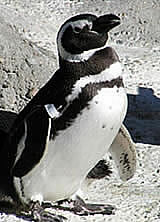 The Magellanic penguin is the most numerous of the Spheniscus penguins. 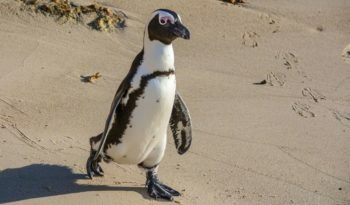 Its nearest relatives are the African Penguin, the Humboldt Penguin and the Galapagos Penguin. The Magellanic penguin is the largest of the warm-weather penguins. 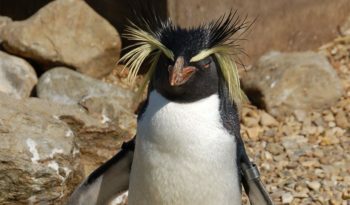 This penguin was named after Ferdinand Magellan who first saw them in 1519 on his first voyage around the tip of South America. Like its three other closely related relatives in the Spheniscus genus, the Magellanic penguin has black-to-brown shading on its back and white colouring on its breast and trunk. 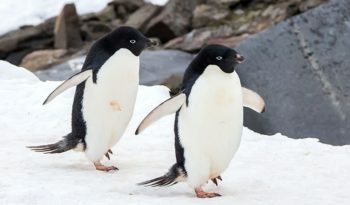 The Magellanic penguins chests have scattered black spots. The Magellanic penguin can be distinguished from Humboldt and African penguins by the two bands crossing its front. 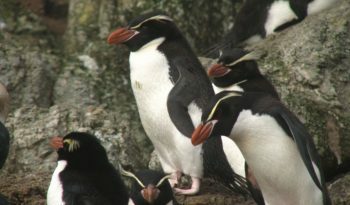 One band is a wide black strip under the chin and another is in the shape of an upside down horseshoe on the stomach. In Humboldt penguins, this band is somewhat incomplete and in African penguins it is absent. Magellanic Penguins have very dense feathers: more than 70 per square inch. Their feathers have oil on them, for waterproofing. Their ‘tuxedo’ attire not only gives them a somewhat comical air, but it also helps hide them from predators. Their white belly blends in with the bright sun on land, while their black back blends in with the dark ocean waves. Magellanic Penguins stand about 27 inches (70 centimetres) tall and weigh about 9 pounds (4 kilograms). During the warmer weather of the breeding season Magellanic penguins lose the feathers around their eyes. When it starts to get cold again the feathers grow back. Magellanic penguins feed in the water, preying on cuttlefish, sardines, squid, krill and other crustaceans caught on relatively shallow pursuit dives. Magellanic Penguins drink sea water, filtering out the salt with their salt excreting glands. Magellanic penguins are excellent long distance swimmers and often hunt in groups to aid in catching prey. Using their wings like paddles, they can achieve speeds of over 15 miles per hour. 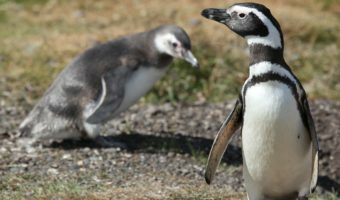 Breeding season for the Magellanic penguins is from late September to early February when adults come to shore to establish nesting sites within loose colonies. Naturally shy and seclusive on land, mated pairs nest in deep burrows (often hiding there when disturbed) where the female lays two eggs. 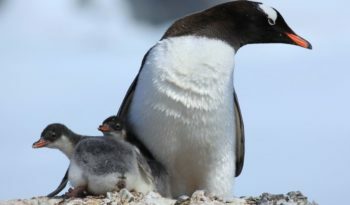 Both the male and female share in the responsibility of caring for the chicks, often taking shifts lasting ten to fifteen days while the other hunts for food. The eggs take five to six weeks to hatch and the chicks will stay in the burrow for another month when they will molt into their adult feathers. At 60 to 70 days old the chicks are ready to head out to sea. Magellanic penguins are occasionally preyed upon by the Southern sea lion. Unguarded or abandoned chicks and eggs fall prey to the Kelp gull and the Giant petrel. 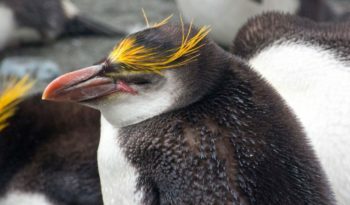 Millions of Magellanic Penguins still live on the coasts of Chile and Argentina, however, the main threats to these species are the vulnerability of large breeding colonies to oil spills and the decline of fish populations, as well as predators including sea lions feeding on adults and giant petrels preying on penguin chicks.